Overview | What Is A Media Lab? Where did media labs come from and why do they occupy such an important role in contemporary discourse? What are practices and places in which media theory is produced? In the context of the university, what are the relations of media labs and (digital) humanities labs? What sorts of claims follow from the use of one term over the other? Outside of the classroom and the library, what are the “other places” of pedagogy in the era of networked digital media? How are media labs part of the specific institutional situation of the corporate university (i.e. limited-term contracts, external funding, relationship to organized labour etc.)? Media labs are places where the production, labour and conceptualization of media occurs. They are an excellent example of what Michel Foucault describes as heterotopic space, ambiguous in terms of their inextricable mix of complicities and revolutionary potential. They have a specific modern history both as an object of knowledge and a site where knowledge is produced, both in and outside universities. Whether as a discourse or as an actual place, “the lab” occupies an increasingly important role in the renegotiation of disciplinary borders, practical humanities methods, and relations to conceptual, economic and critical work. At the behest of certain types of institutions, specific combinations of discourses, practices, techniques and forms come together in media labs to produce and study specific kinds of technological objects. In the process, they also produce new discourses and shape new kinds of subjects. For example, as the discourse around labs evolves, professors may become “makers” and “hackers”; students may become “high qualified personnel” and “techies”; academics in general become “knowledge workers” and, in many cases, “edupreneurs” or simply “entrepreneurs.” Research becomes more quantifiable; as a corollary, administrators expect they can measure “impact” and “outcomes” of academic work in a credible and useful fashion. Often the use of the term “lab” is closely linked to notions of “disruption,” “creativity” and “innovation” – terms driving the neoliberal industrialization of the knowledge economy. Yet none of these changes in discourse and the creation of new subjectivities are necessary or universal; they have demonstrable impact, but they are also inconsistent, contingent, and perhaps temporary. Because of their close ties to discourses of innovation and disruption in neoliberal economics, media labs present themselves to the world as though they have no precedent. Yet both lab spaces and the discourse of innovation and disruption itself have long histories, deeply woven into the fabric of modernity. Today, we most ofen associate the term “media lab” with the 1980s-born MIT Media Lab. It played and continues to play a central role in the linking of universities, commerce, the military, and technological industry. This powerful assemblage of institutions created specific practices for innovation that were replicated across the globe in the later half of the 20th century. We can read the influence of the MIT Media Lab into our contemporary moment, tracking how the model of the media lab has proliferated and shifted. For example, the Community Guilds STE(A)M truck is fascinating because of the way in which its name explicitly includes but literally brackets the arts and embodies a kind of neoliberal belief that education can work on an entrepreneurial model. We can also read this history backward, toward the Cold War-emergence of the military-industrial-university sector and its contributions towards the development of digital culture. Further, we can also read this history back to the relative beginnings media labs in turn-of-the-century modernity. Thomas Edison’s facility at Menlo Park plays an important role in major texts on the theory and history of modern media by scholars such as Lisa Gitelman and Friedrich Kittler, but it also demonstrates that there has always been a relationship between innovation and commerce. Edison was as much businessman as inventor, and the trappings of scientificity have a long history of use in order to justify commercial gain. Early labs like Menlo Park are also a reminder of the necessity of providing historical context for a present that pretends to have none. We are particularly interested in elaborating on what Jonathan Sterne refers to as the “analog humanities,” the cultural and material infrastructures on which humanists have always depended. Though this network of material, institutional, discursive and technological conditions has only become visible in retrospect, it will be a crucial component of our own investigation. It also provides a stronger and longer historical context for digital humanities. 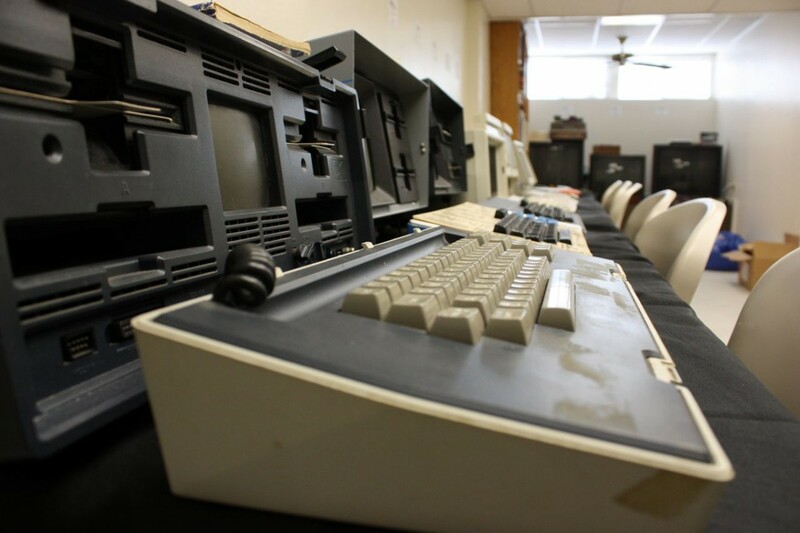 As scholars like Charles Acland, Haidee Wasson and Jonathan Sterne have pointed out, there is a long history of film projectors, mimeograph machines, filmstrips, overhead projectors and other analog media playing important roles in the classroom. In terms of pedagogy in North America, we want to briefly point to several examples of analog humanities labs. In the late 19th century, the psychophysical laboratories at Harvard stand as an early model of a scientific measuring of effects of modern media. Hugo Münsterberg‘s early work established a scientific context for the new medium of cinema, and argued for a physiological understanding of media that offered a shared ground for cinema and media theory. Language labs were also places where students sat in cubicles with headphones and phonographs or tape recorders, engaging in rote learning by recitation. In the 1960s, many universities in Canada made large investments in audiovisual technologies like reel-to-reel tape as part of a policy incentive. Home economics labs – chiefly test kitchens for experiments in food science, but also sewing labs – provide another important early example. For over a century, such labs have produced and mediated human beings as modern subjects. Labs play a broader discursive and symbolic role as well. For example, Jackson Lears has documented the ways in which advertising adopted lab coats, clipboards, punch cards and computers as claims of rationality. With the aid of such material signifiers and an accompanying discourse of scientificity, mid-20th century advertisers actively strove to transform the public perception of advertising from its early hucksterism (as exemplified in the figure of P.T. Barnum, and the notion of the customer as a sucker) to something that appeared more legitimate, more rational, more scientific. We argue a similar trend is at work in the humanities now. Michał Krzyżanowski uses the notion of “pre-legitimation of practice” to describe how writers often present visions constructed from what they believe their practices might produce rather than actual accounts of their activities. Prelegitimation is a key component of the construction of new forms of expertise, invoking “what we always do” or “what we would do” at a time when lab activities are still emerging. Finally, we will also address the range of compelling alternatives to the model of the lab as an engine driving neoliberal economics, commercialism, and scientificity. The genealogy of hacker labs, for example, does not fit within academic or corporate boundaries, yet it presents powerful models for making and design practice. We are particularly interested in exploring the extent to which hacker labs are capable of producing critical paradigms as well as alternative situations for learning and making. The current use of the term “lab” has been invigorated by the emergent field of Digital Humanities, especially some of its more design-oriented accounts. As the co-authors of Digital_Humanities put it, labs express and produce a “collaborative, team-based ethos, embracing a triangulation of arts practice, critique, and outreach as they merge research, pedagogy, publication, and generative practices” (58). Yet many of the intense internal debates going on at this moment in the DH community have to do precisely with whether DH as a field wants, or is even capable of, the kind of historical contextualization that critical and post-structuralist theory propose, let alone the recent debates about the possibilities for a “posthumanities” (especially in Rosi Braidotti‘s work). We address this important context through historical and theoretical investigations into the nature of DH labs, drawing on material from original interviews and other source materials. While offering a critical genealogy of the notion of the media and humanities lab, we also want to investigate some of the affordances it can offer for the scholarship and research in the 21st century. The project offers a more detailed account of the media lab’s potential to open up new possibilities for thought and action in the present. Besides discussing Digital Humanities, we draw extensively on our own areas of expertise. Sections of the project will focus on sites such as the Berlin Humboldt University Media Archaeological Fundus, and Lori Emerson’s Media Archaeology Lab at Boulder, Colorado. Other sections will describe the history of entities such as the Canadian Film Centre (CFC) Media Lab, the first of its kind in Canada. The CFC Media Lab survived until the exact moment that universities started to duplicate it. Since CFC could not grant degrees, it eventually became a startup incubator program so it would produce more revenue than the constant stream of professional artists that were its traditional constituency. This history demonstrates once again the imbrication of creativity, innovation and monetization in the realm of media labs; it also offers an alternative way to investigate what a lab could mean as a cross-section of work in education, theory and critical practice.